Partial Solar Eclipse of May 10, 1994. "A great evil dragon that lives in the sky had tried to eat the sun, but the sun was too hot and the dragon was forced to spit it out." Victor Rogus is an amateur astronomer, and this is the fourth in his series of exclusive Space.com posts about amateur astronomy. He contributed this article to Space.com's Expert Voices: Op-Ed & Insights. It was May 10, 1994 — a perfect, perfect day for solar astronomy! It seemed that my prayers had been answered. The clouds of the previous night had cleared out by 2 a.m., giving me the time I needed to polar align my telescope's mount before the rising of the sun. Meanwhile, rain fell to the west, and more rain and clouds obscured the eastern sky. But here, a huge, lazy dome of high pressure rested squarely atop the central United States. This day was of special interest to the astronomical community, and the timing of this clear, spring day seemed heaven sent. That afternoon, at 12:04 p.m., a near total eclipse would darken the sun. Farther downstate, some observers would enjoy a perfect annular, or "ring of fire," eclipse event, highlighted by a concentric ring of light around the dark lunar disk. Due to the apparent size of the moon, at this time, the solar face would not be completely covered — making this a partial eclipse any way you looked at it. My backyard, in Des Plaines, Ill., was located at the extreme northern edge of the limit of annularity. This condition, though not conducive to a perfectly centered lunar disk upon the solar face, would give me a better chance of seeing and photographing the famous "Baily's beads" phenomenon. (These are bright areas of sunlight that sometimes appear momentarily around the edge of the lunar disk shortly before and after a solar eclipse. The beads of light are caused by sunlight pouring through the lunar valleys near the limb or edge of the circumference of the moon. They are named after the 18th-century British astronomer, Francis Baily.) This fact had influenced my decision to stay here, on the chance of experiencing the rare event of Baily's beads. Since many friends and neighbors had asked me about this well-advertised eclipse, I had agreed to share this grand adventure with them. My wife and I thought to make something of a "day star" party for anyone who was interested in joining us, and we provided aluminum-coated mylar solar-filter glasses and views through a filtered telescope throughout the entire spectacle. This was a fine opportunity to help educate the public about astronomy , in general, and the uphill battle we astronomers wage against the effects of light pollution, an obligation that every amateur and professional astronomer should be willing to embrace. If we humans are to preserve the majesty that the night sky holds for those living today, and for the generations to follow, the problem of light pollution must be tackled. I also wanted a few visitors so someone could monitor the drop in the air temperature and other subtle environmental changes at the moment of total eclipse. I would be busy at the camera throughout the entire event, as I had decided to try to document it from start to finish. The eclipse was predicted to last three to three-and-a-half hours. I wanted to make a series of bracketed exposures (based upon my exposure tests from previous solar photography outings) every 10 minutes. 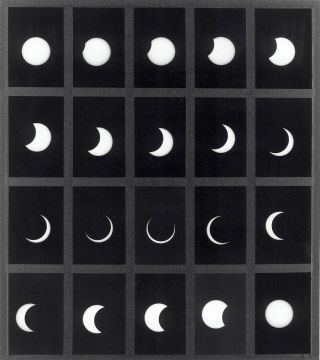 I would then combine the best exposure of each set with the others into one composite image showing the moon's progressive path across the solar face. I knew I would end up with between 18 and 21 exposures, providing a fair representation of the entire event. This plan gave me an advantage over other astrophotographers who planned only to make photos during the moments of maximum eclipse. As the time of the eclipse neared, friends and neighbors began to arrive, making themselves at home in lawn chairs. It was warm, nearly 70 degrees Fahrenheit (21 degrees Celsius), clear and comfortable. One could feel the excitement in the air, as curious folks gathered on this Tuesday morning in hopes of seeing a truly awe-inspiring sight. But, being that it was a Tuesday, guests had to deal with bosses and job obligations. This is something any budding astronomer should be aware of — the workings of the cosmic clock wait for no man, and people are little more than spectators in the great Colosseum of the universe. Either you are there for the show, or you are not, whatever it takes. I had set up a VHS video camera on a tripod to make a record of our party, as watching people's reactions to a solar eclipse is often nearly as much fun as the eclipse itself. A news program on television told of how more than a thousand people had converged upon the Adler Planetarium in Chicago to witness this event. It also told of how cameras across the country were ready to record images of the eclipsed sun. By 11:40 a.m., three-quarters of the sun was hidden from view. Mylar solar glasses were passed from hand to hand, and it began to feel cooler. Between exposures, my guests took turns at the eyepiece of my filtered solar-finder scope and would sneak a peek through my camera's back. "Wow!" "Amazing!" My guests did not seem disappointed, and there was no reason they should have been. The eclipse was beautiful and dramatic. At 11:58 a.m., my wife shouted out, "Look at the shadows under the trees!" Indeed, the leaves in the trees were transformed into thousands of pinhole cameras displaying countless images of the crescent sun upon the ground and the sidewalk. "Try to get a photo, and check the air temperature." I replied that I could not, for I did not have time as I had to reload my film cameras for the next battery of solar photos. Indeed the air temperature had dropped a full 10 degrees F since this adventure had started, and the chirping songbirds of springtime began to quiet themselves as though for the evening. At 12:04 p.m., the moment of maximum eclipse was upon us, and I could almost feel the camera shutters around the country clicking away — mine was no exception. Making extra exposures for "insurance," I felt confident my little film canisters had captured the eclipsed sun. As I turned the telescope over to the observers, I thought of how I was only halfway through with my project, and I still had to do my best to record the moon's departure from the solar disk. No Baily's beads appeared, and only three sunspots way too small to be recorded at prime focus decorated the solar disk — but overall, a breathtaking sight. Now that my guests had gotten their fill of solar science, they began to gather up their feline friends, thank me and bid farewell. And now that I was alone, I could concentrate on finishing my task. Standing by my camera and telescope, I became bewildered by the idea that I had witnessed a celestial act that would not play out again in this magnitude over the Chicagoland area until sometime in the year 2099. Eventually, the Chinese sky dragon had once again lost his appetite for this solar banquet, and the familiar face of old Sol again returned to us. As I basked in solar glory, I give thanks for the clear skies and warm weather. My NOAA weather radio was now predicting increasing clouds and a 30 percent chance of thunderstorms by the next morning — and indeed it did rain very hard, but only shortly after the eclipse had ended. With all my excitement, I did not notice the exact time that the eclipse ended. I promised myself that I would be more careful with record keeping in the future. Now I was off to have my film developed. The next day, with my photographs before me, I began to paste my best images onto a large art board. Arranging them into four rows of five photos each, I stood back to admire my work. The entire story of the 94-percent partial solar eclipse of May 10, 1994 was told there through my photographs, and I was pleased. My intention was to re-photograph the art board on a copy stand with a 4 x 5-inch format camera. From that negative, I would make the final print. To drop out the false blue color of the sun, created by the solar filter, I had decided to make the final print a black-and-white version. Upon seeing this final copy, I knew I had a good image. It would soon be published in a feature article in Astronomy Magazine, called "Golden Eclipse Memories." Indeed, a great day and truly a wonderful memory. Space.com is hosting a slideshow of Rogus' images. Rogus' most recent Op-Ed was "Capturing the 2000 Lunar Eclipse from 'Hell on Ice.'" The views expressed are those of the author and do not necessarily reflect the views of the publisher. This version of the article was originally published on Space.com.